Executed in thuya, elm, lemon and various other indigenous woods. 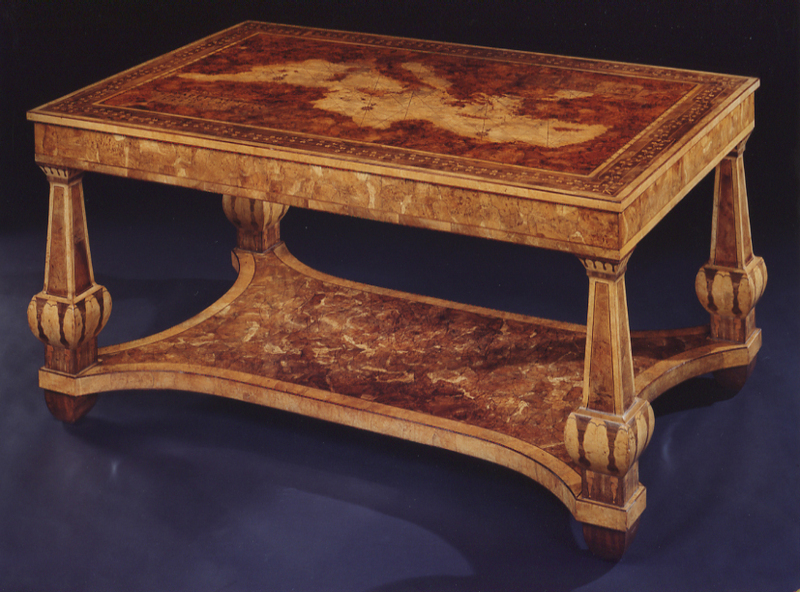 A highly important and rare table. Made with the greatest of care and attention to detail. 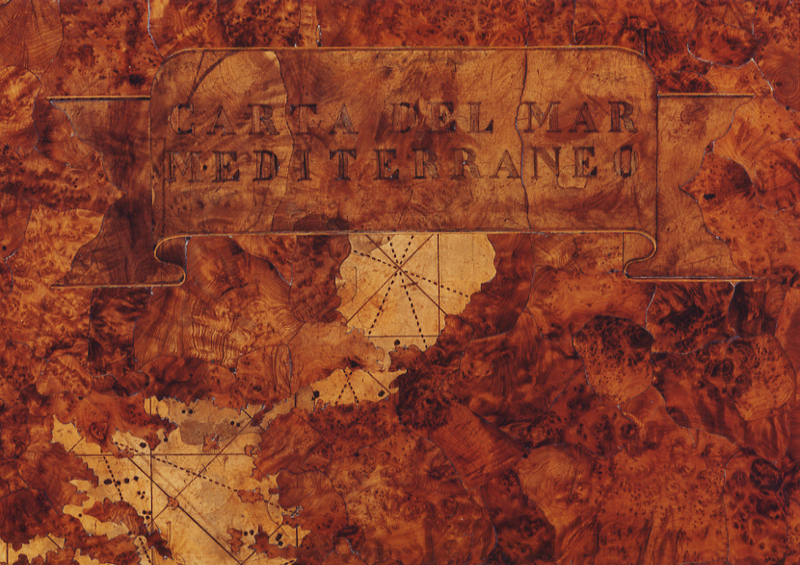 The execution of the marquetry being second to none as are the choice of veneers that have been employed. As yet an unknown subject which was created by a genius while working for the Spanish Royal Family. The construction being of supreme quality in order to produce a true masterpiece. 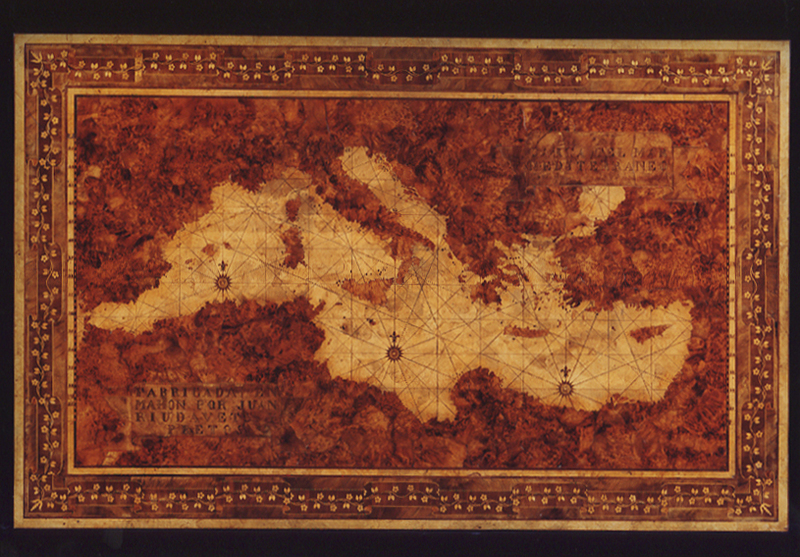 The top represents a map of the MediterraneanSea including a perfect reproduction of the coastal areas (as seen on a map) and the many islands, big and small. 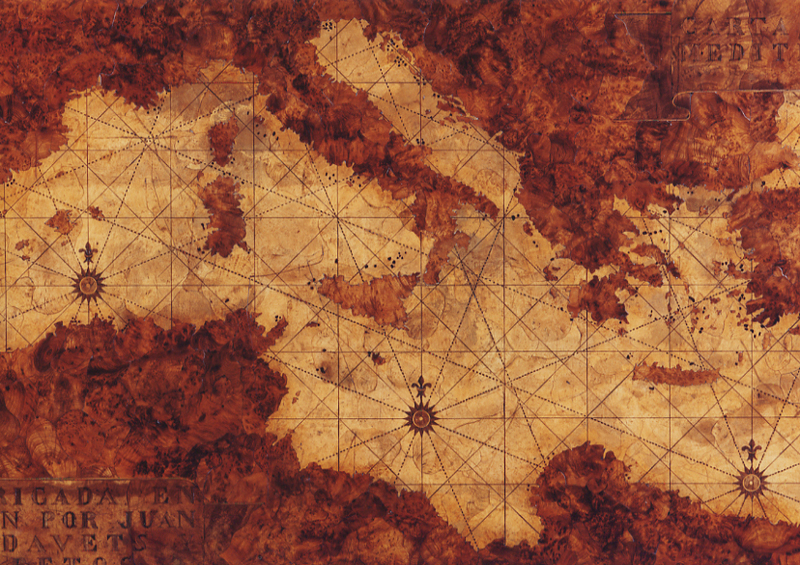 On the two sides are reproduced and numbered the lines of latitude and a series of rhum lines are inlaid into the marine areas (sea) which emanate from starred circles under three fleurs de lys. 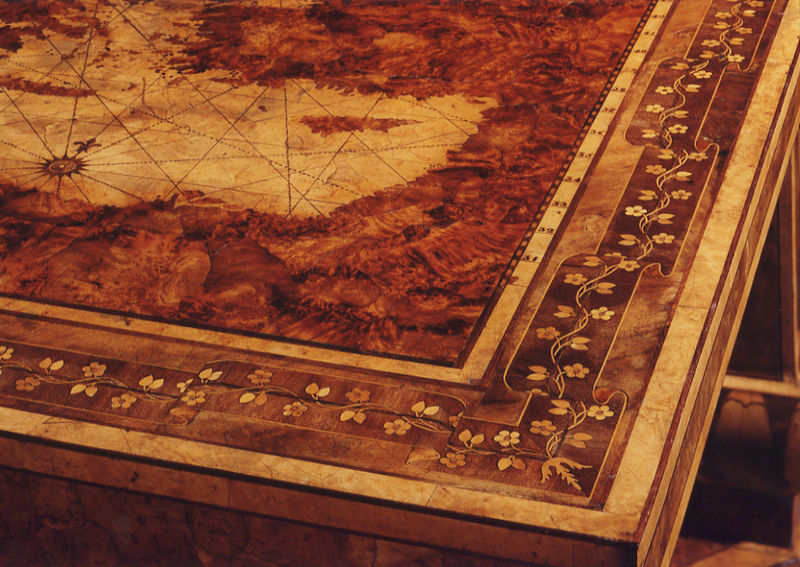 The exterior of the top is inlaid with flowers around the perimeter as a trompe l’oeil imitating a table cloth on which the map is resting. Diametrically opposed escutcheons on two corners of the table retain the maker’s name and place of execution with a description of the subject matter. The stretcher is made up of indigenous woods to simulate water. 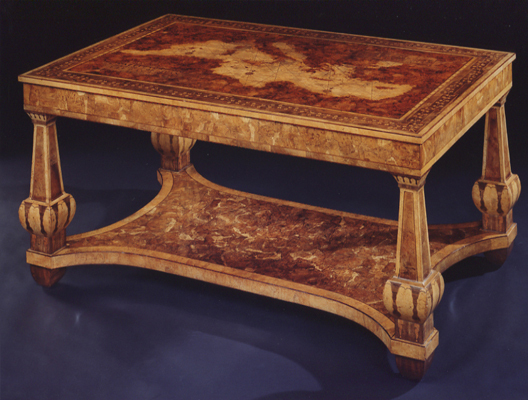 The origins of this table are most curious. It was won by Don Bartolome de Olives y Segui in a raffle that took place in Mahon at the Casa de la Misericordia on the 13th of August 1840 with a value put on it of 1250 reales. Since then it has never left the family! and dated 1818 – Spanish National Collection. 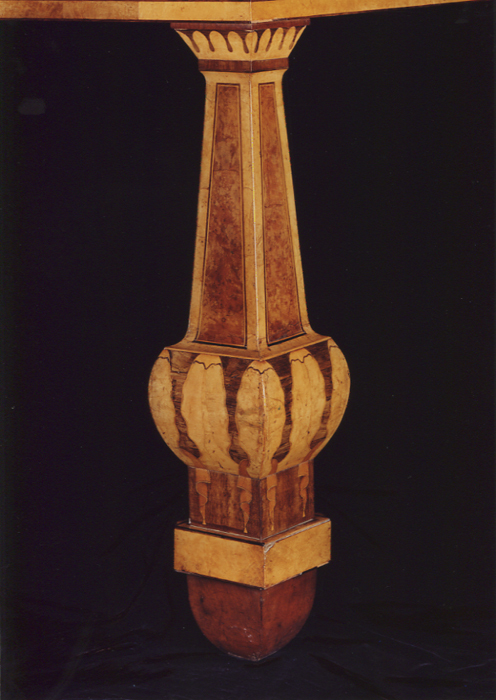 Riudavets was commissioned to make a superb guitar for the Spanish King Fernando VII in 1818 (which is now in the Palacio Real Madrid); it is exactly the same style as the table. 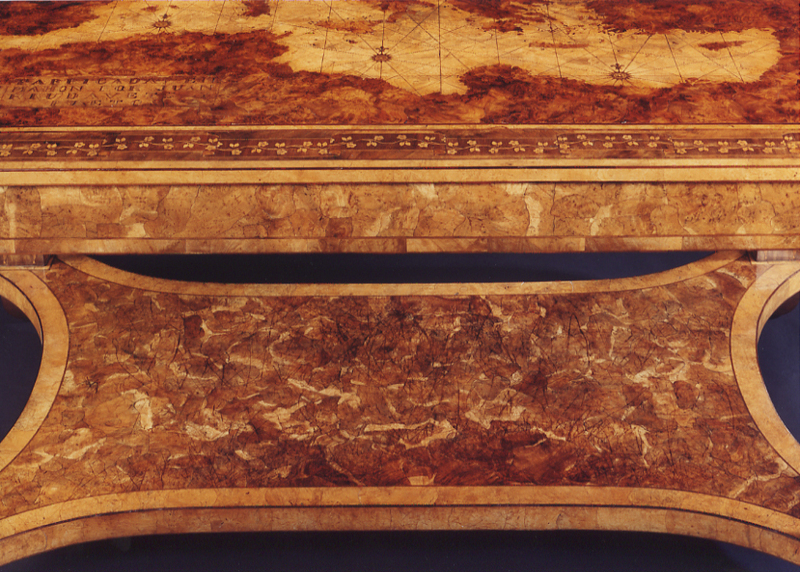 The subject matter is totally marine and even has an inlaid mother of pearl picture depicting the bay of Mahon. 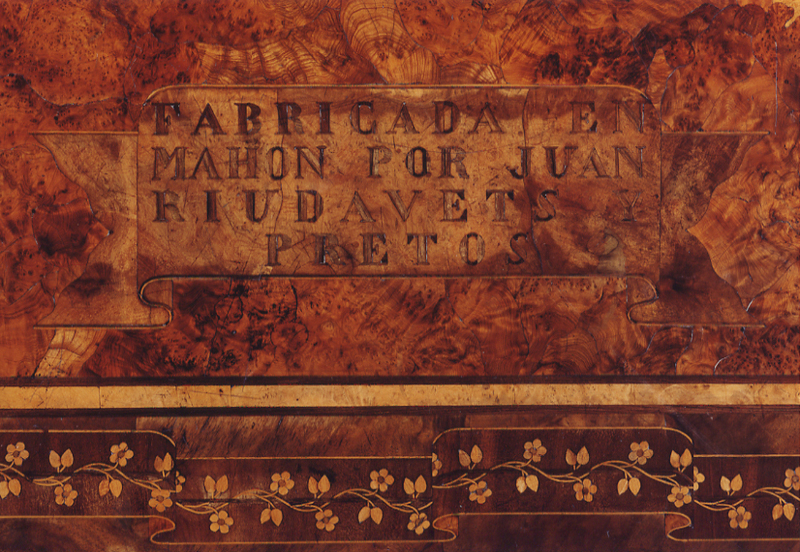 The back is inlaid with drapery which is identical to the drapes found on the legs of the “Riudavets Table”. It would be safe to assume that Juan Riudavetsdelivered the guitar to the King and for one reason or another kept the table for himself as a masterpiece. 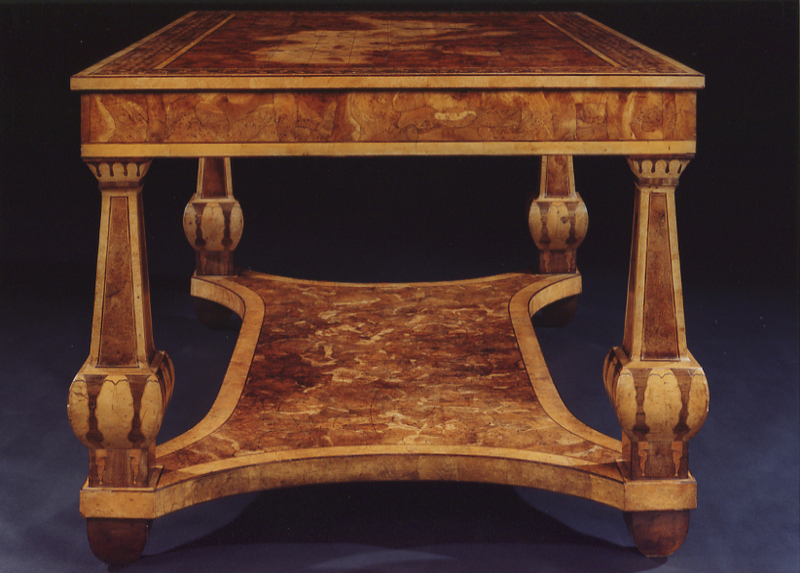 This table being unique and with such a precise provenance can only be described as “one of the rarest pieces of 19th century European furniture”. It has survived to this day and is in a remarkable state of preservation. “1802 España entre dos siglos y la devolucion de Menorca”, no. 54, p. 216, October 2002. “Mesa ornamental”. Bordás Ibáñez, Madrid, 1989, no. 223, p. 134, Garcia Marcellán, José, l965, pp. 66-99. Lafuente Vanrell, L., 1922, p. 373. Height 38 1/2in (98cm). Width 60 1/2in (154cm). Depth 30 1/4in (77cm).